В ТСЦ «Сафари» Вам могут предложить широкий выбор мото- и электроледобуров Strikemaster. The clean performance of an electric razor with the might of a brushcutter. On the ice, you'll find the bottom of hole after hole without burning an ounce of gas. The Electra Lazer 12000 DP sips from a 12 volt battery while swallowing the lake in gulps. Specially designed stainless steel Lazer Blades cut crisp corridors through the ice. External battery cables clamp to your vehicle as an alternative power source. (12 volt battery, cables and chargers included). • Optional Extensions Available for Cutting Ice Thicker than 42"
StrikeMaster adds more meat to the cutting tool that defines power augers. A 42cc, 2.5 horsepower Solo® motor teams with stainless steel Lazer Blades to turn the lake into an ICEE®. Low fuel consumption and generous 24-ounce gas tank combine for hundreds of holes between fills. Electronic ignition reduces wear and tear on your rotator cuff. Handles made with a high impact composite compound manage the muscle without adding body fat. The Lazer Mag is the picture of form and fitness. 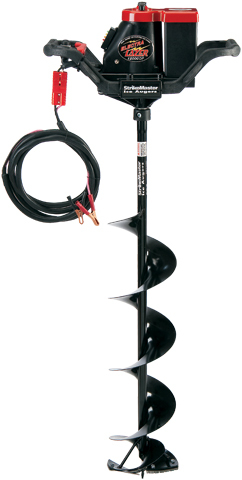 The ultra modern StrikeMaster Lazer Pro is the new yardstick in power auger design and performance. Fortified by a well developed 54cc, 3-horsepower Solo® motor, the Lazer Pro starts effortlessly and runs perpetually. A 40:1 gear ratio converts that energy into a rapid paced, yet silky smooth race to the bottom of the hole. Incredibly, power of this portion weighs in at only 29-pounds. She ain't heavy, she's your auger.